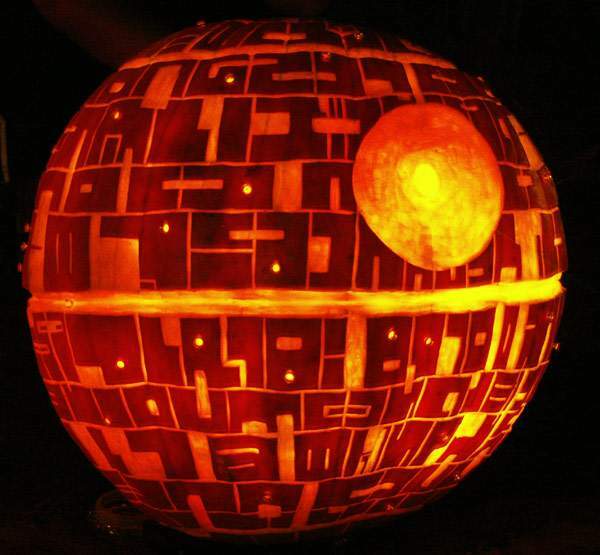 There are limits to my pumpkin carving DIY-yness. Therefore I blog. Which allows me to steal someone else's pumpkin carving DIY-yness (as demonstrated above). I am not a man of few words. My grandfather--the greatest man living or dead I've ever actually known--WAS a man of few words. And I've always wished I could be more like he was. A man with quiet dignity. A man whose actions defined him far more than his words ever could. A man whose words consequently meant something more because he spoke when the time called for it and when he was specifically moved to do so. At least this is how I knew him. How I remember him. Those of you who know me will find the first sentence of this post to be just about the biggest understatement I've ever made in this space. I am--scientifically speaking--a wise-assed loudmouth. I am impulsive, passionate, often reckless with my words--a condition I've worked hard to somewhat temper over the last few years. But even in my more mature, "reformed" state, I will never be confused for a man like my grandfather in this manner. And this saddens me to a degree. Sure, we are who we are and we have to accept that and I'm fine with all that blah blah blah. However, more than the aforementioned descriptors above, my grandfather was a man of true substance. And maybe I have to try a little harder to stay true to such a moral objective since I'm not as inherently disciplined as he was. But if that IS the case and I fundamentally AM this guy, then I ought to feel more convicted that my work in this space should reflect that. Because the honest truth is that my blog posts this year have generally represented a "less is more", "the work speaks for itself" style of writing. Want my opinions on music (of which there are FAR too many)? Most often, my response has been "check out the playlist!" Creating playlists is an absolute LOVE of mine on a spiritual level and something I've been doing since the days of the cassette. Playlists are my other language (my Spanish is barely passable), my love letter, my badge, my signature, often my mission statement. But they are not enough. I write ABOUT music in this space far too infrequently these days for someone who claims it as such an integral part of his soul. I have unwittingly become a casualty of the social networking culture that tells me to keep it as brief and skeletal as possible for fear of losing you, my beloved readers, as an audience. Yet while I love each and every one of you who stumbles upon this space, I started this blog for myself. As a way to keep writing--since writing is one of my other absolute spiritual loves/needs. So I'm putting it down in black and white, here and now. Same amount of playlists, but more writing. I'm a loudmouth, so one of my primary creative spaces should reflect such. The internet is so full of lies--even the carefully constructed parts we create where we lie about ourselves to a certain degree. This is a place for an honest representation unlike those other places. For those of you who "read" or "check" my blog consistently, feel free to skip over all my potential verbal largess and click "play" and enjoy the tunes as always. It won't hurt my feelings and--frankly--I'll never know anyway, right? What I seek to add and give to you is more music talk and discussion throughout the course of the year as opposed to just saving it for the end of the year "best-of" lists. And this is not just adding more words for the sake of it. Instead, it is to bring the soul back to this thing, to bring the mission back to this thing. I want to write for myself, but I want to share in my own zany, occasionally witty, often ridiculous way that music plays a role in my life. Our life/lives. "About music and all that that implies", remember? I've been to a ton of great shows this year and seen a ton of great artists that I haven't spoken of in this space (Lollapalooza, Radiohead, Thee Oh Sees, Ty Segall, King Tuff, Frank Ocean, Sigur Ros, Bloc Party--the list is ridiculously and FORTUNATELY deep). I co-own/manage a record label (real vinyl records) and we're about to release a brand new album next month! I've had TONS to potentially write about and I've wasted far too many opportunities. And that has to change. So that when I'm 65 and struggling to keep my kidneys in check, I'll have some documentation that my musical life had rich roots throughout. So there it is. I sat down at this little coffee shop a few blocks from home and thought I'd post another fair to spare playlist blog post. But these words just started typing themselves. I assure you that I construct each of these playlists with purpose, consideration, and often deeper messages that even I don't fully discover until much later. Well now, I want the rest of this space to adhere to that standard. Not a post everyday for the sake of making noise. But a little more meat on the bones won't hurt.